I swore I wasn’t going to read another Stuart MacBride novel. The last time I read one of his Logan McRae books, it went in a very, very creepy direction, and I dropped it before it could get any worse. I mentioned on this blog that I was done with it. But one day I was looking for another book to read, and I had a momentary lapse of memory. 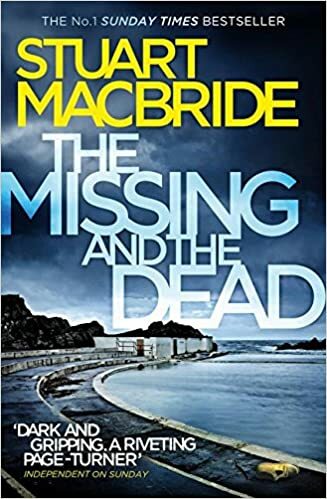 By the time I remembered what I thought of the series, The Missing and the Dead was on my Kindle. I figured I’d give it a chance. It didn’t offend me the way the last one did. And I stayed with it to the end. But I’m still not a fan. Logan McRae used to be a Scottish police detective. But somewhere since the last story I read, he got demoted to uniformed policing in the far north – centered at a station in the town of Banff, on the North Sea. He’s in charge of a small squad, but of course the plainclothes detectives get to do the interesting work. There’s a lot of work to do. Logan manages to rescue a man kidnapped and mutilated by a sexual sadist – but no one is sure the poor man wouldn’t be better off dead. The body of a little girl is found in an abandoned swimming pool – but she was battered to death, not drowned. And a group of brazen robbers are physically removing cash machines from small businesses. Logan finds himself constantly bedeviled by detectives who have the authority to take over his most interesting cases, warn him off certain lines of investigation in other cases, and threaten his career when he makes mistakes (which he does). His only advocate is Inspector Steele, a raddled lesbian who shamelessly exploits him. It all culminates in a terrifying confrontation at the old swimming pool, where Logan’s deepest convictions about law enforcement are tested to the breaking point. I read it all through, and it kept my interest. But to be honest, I thought it would never end. When I thought the story must be nearly over, I wasn’t even half way through. Logan’s woes and frustrations are doubtless highly realistic, and policemen must cheer the depiction of their real-life challenges. But it got to be a little much for me. I’ve always wondered, reading previous books, why Logan stays with his thankless job. I still wonder. The writing’s quite good. If this sounds to you like the kind of story you’d enjoy, I recommend it. But I’m not going back, unless I forget my resolution again. Cautions for language and very disturbing subject matter.